Jypyä Pop (Turku, Finland) on 6 December 2018 in Lifestyle & Culture and Portfolio. Le goéland attend sa part. @Nina: Yes, it is not very good customer..
Fortunatly the celphone: you didn't have to waste that. Excellent ! @Gérard: I almost always have a camera when I move somewhere out. Today, there are good cameras on the phones and this picture really succeeded. The gull looks hungry . . as always ! Ah, they have a lovely guest, really peaceful day ! @Hiro: I'm not sure if a fishmonger is happy for a quiet day. Love it! The gull gets first choice. 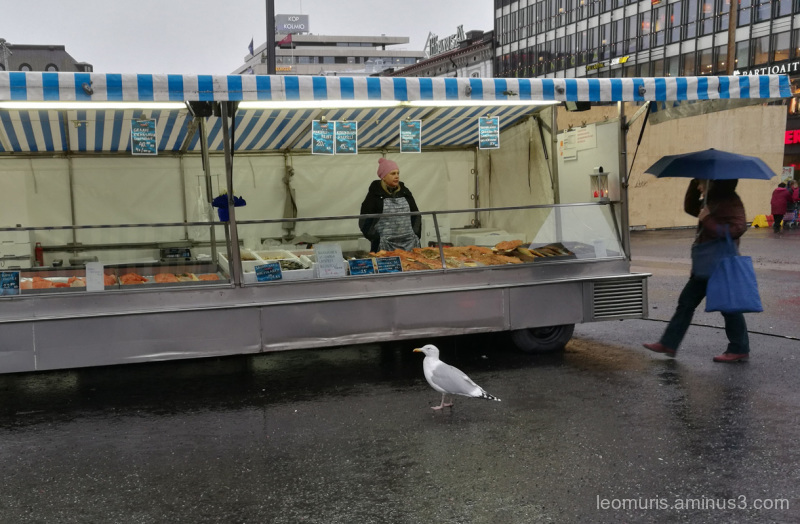 The seagull knows something enticing is behind the counter. Knows he's waiting to be served. Great capture!! I think the gull waits for his fish! Delightful image. The first client is the bird. That Seagull is a smart Seagull ;-) Great catch!